The Pinot is a new product category for Playback Designs, but borrows many concepts and algorithms from existing Playback Designs products. At its core is a very high performance and high resolution professional A/D converter with an analog input buffer, that are both the result of two years of intense research and prototyping. Recent listening tests with recording engineers showed that the Pinot is so transparent when combined with its sister product, the Merlot DAC, that it is hard to distinguish it from the direct feed from the analog source. The core converter always runs at a very high sample rate (256FS) and shifts the burden of converting to lower sample rates to the digital domain, where over many years Playback Designs has developed unique algorithms that helped it position its products on a very high performance scale. 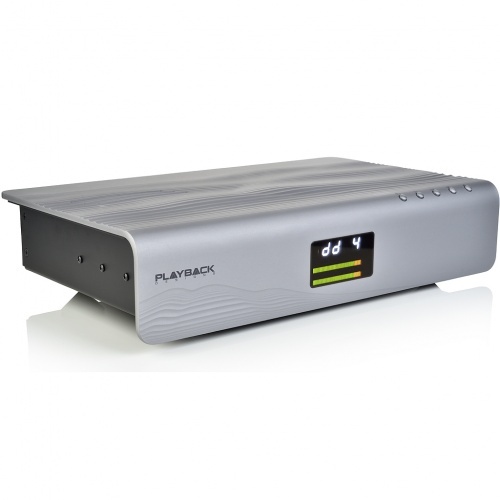 For this the same programmable FPGA based architecture is used as for all other Playback Designs products. For its highest resolution output (DSD4x) two different filters have been developed that the user can select via the front panel interface. An automatic calibration feature has been built in to remove DC offset from the digital output signal. The algorithms for all Playback Designs products are constantly being researched and updated with performance enhancements and new features. These software updates are made available to all users free of charge and can be loaded into the Pinot by simply playing a specially encoded wave file into one of its digital inputs. This virtually guarantees that the Pinot can be kept up-to-date as new audio formats become available and Playback Designs finds new ways to improve the performance. 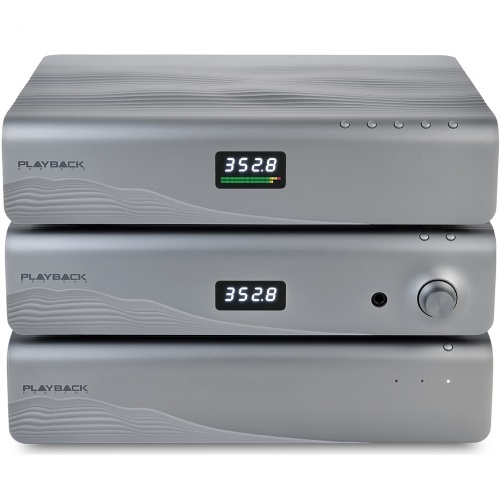 Playback Designs started using MEMS (micro-electro-mechanical system) based oscillators (instead of crystal based oscillators) already years ago, and with astonishing results. These are custom made devices with Playback Designs’ specifications and offer a jitter performance beyond what is possible with crystal based oscillators. But that alone was not enough: Playback Designs developed a very unusual algorithm to control the frequency of the oscillator which was already used for the MPS-5 and enhanced several times through the years. This algorithm allows the Pinot to be clocked from an external source without an audible performance penalty. In order to support quad DSD the USB and optical PLink output formats had to be expanded and redesigned. Both interfaces now support any PCM and DSD format up to 11.2MHz sample rate. For the final digital output the user can select any sample rate for PCM up to 384kHz and for DSD up to 11.2MHz (quad DSD). PLink is Playback Designs’ proprietary optical interface standard to connect its various products with a fully clock synchronous link and galvanic isolation. We found there is no other interface standard with the same sonic performance and flexibility in audio formats. The PLink interface is the preferred connection method to the Merlot DAC for record and playback monitoring as it supports all digital formats and, therefore, does not require any conversion. The USB interface should be used to connect any computer running recording software by Playback Designs or a 3rd party. 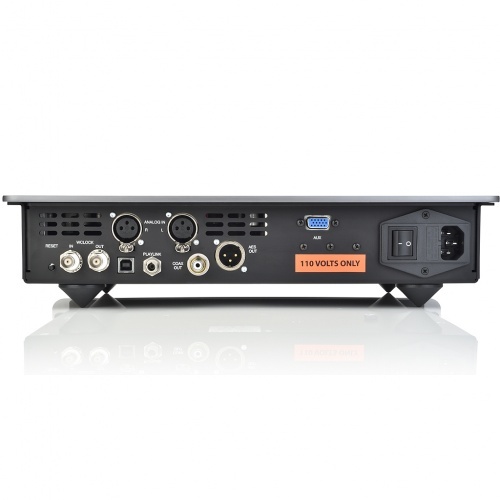 Both the AES and Coax outputs support PCM up to 192kHz and DSD via DoP. A very gentle passive circuit protects the analog input signal from any RF noise before sending it to a true differential low noise input stage with matched differential impedances. After a unique floating double differential circuit to remove common-mode distortions a differential low impedance very wide bandwidth gain stage follows before the differential ADC stage. This active gain stage also compensates for any errors caused by the analogue potentiometers resulting in precise proportional noise-to-gain behavior. The entire input stage is quasi dc-coupled with undisturbed sub-sonic characteristics. The overall circuit is linear phase (Bessel) with a constant group delay for all frequencies from 0 to beyond 200kHz. The ultra low distortion level of the analog circuit makes it possible to reveal music ingredients never heard before. Both channels are totally separated and have their own separate linear power supplies for each channel. Levels can be set for each channel individually. To further safeguard overall performance all analog circuits are mounted on a PCB that is completely separate from all digital circuits. As you can see, a lot of attention went into the analog stage of the Pinot since it is a very critical element in the entire chain. Only the best components are used in order to yield the best possible performance with today’s technology. The Pinot uses a newly developed and linear power supply with a custom toroidal transformer with integrated high-tech Mu-metal magnetic and electric shielding. The USB interface supports all digital output formats that the Pinot can generate. It also supports loop-back mode so that the recording computer can send the monitor signal right back to the Pinot where it will appear on its digital outputs for direct monitoring via an external DAC. Playback Designs is offering a basic and very easy-to-use recording software (“Sonoma Recorder”) that can be used for this application, but other 3rd party programs can also be used. 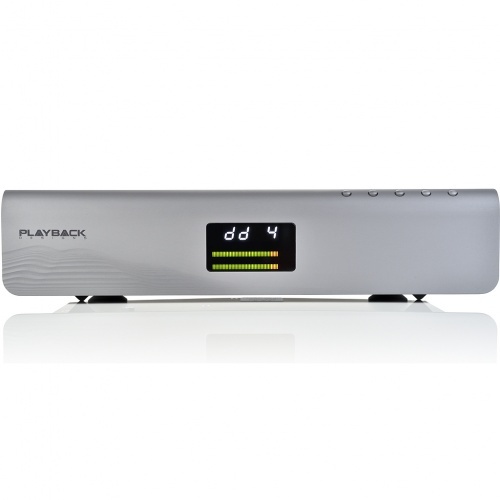 All products from Playback Designs use a fully synchronous architecture. This means that there is only one single clock source in the chassis and all digital devices are driven from this same clock source. There are many switching power supplies and displays that have their own built-in clock source. For high quality digital audio products, however, these devices are not suitable, because their internal clock generators would be asynchronous to the audio sample clock and, therefore, cause sonic artifacts. be clocked externally by the audio sample clock generator. This is why the Pinot and all Playback Designs products use a LED based display. It is not to make the front panel look a certain way, but to make Playback Designs products sound the best possible way. An LED bar-graph is included on the front panel for precise level metering of the analog source signal and for level adjustment.